Belinda Durrant Exhibit at Sudeley Castle: Where’s Mary? Belinda Durrant has three new works on display at Sudeley Castle as part of their exhibition celebrating the quincentenary of the birth of Katherine Parr. She was gracious enough to share them with us and to even write what inspired her to make these works. “It [the exhibit] was made as a direct response to visiting the castle. I am no history scholar…just couldn’t understand why there was so little info about the poor little child at the Castle and decided I was going to find out myself….and promptly discovered that there was nothing much more to find, which just made it all worse, somehow. Katherine Parr was the 6th wife of Henry VIII. After his death in 1547 she married Thomas Seymour and moved to his country residence, Sudeley Castle in 1548 where she gave birth to a daughter, Mary on August 30th of that year. She died from puerperal (childbed) fever just seven days later and is buried in St Mary’s Church within the castle grounds. The site of baby clothing often provokes unexplained sentimental reactions, particularly from women. Freud tells us that this is fetish. Such clothing reminds us of the child itself and is embraced as a substitute for the ‘lost’ child. Freud means ‘lost’ in terms of the fleeting period of babyhood, but in this case, Lady Mary Seymour was apparently quite literally ‘lost’. We are told that Mary became an orphan at just a few months old when her father was executed for treason and that she was sent to live with Katherine Willoughby, the Duchess of Suffolk. I have been able to find out very little else. It seems all record of her disappears after August 29 1550, the eve of her second birthday. The three works I have displayed in the Castle exhibition centre, ‘Where is Mary? 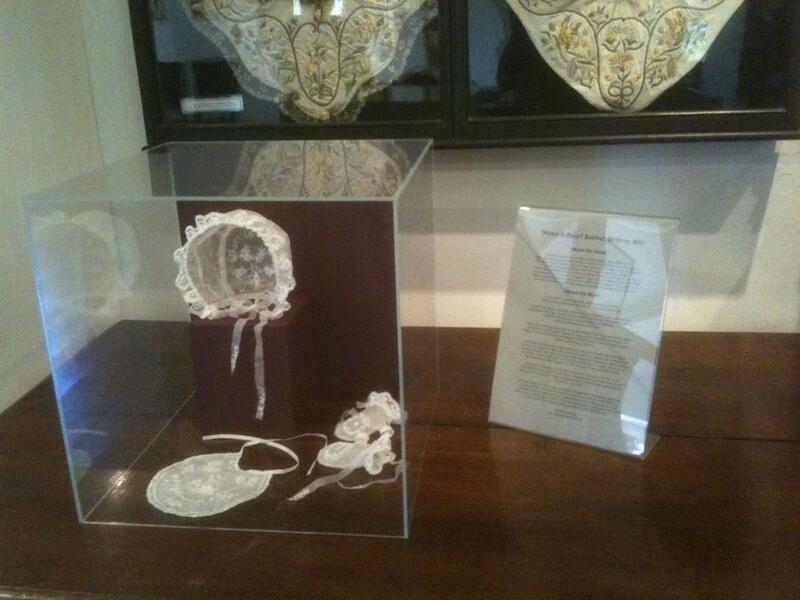 Bonnet, Mittens, Bib’ were made as a direct response to a visit I made to the castle in July 2011. The work is not about embroidery and stitch. It is about the ACTS of embroidering and stitching; the almost ritualistic time, care and love which goes into the making of those very special first clothes which celebrate the arrival of a new child. 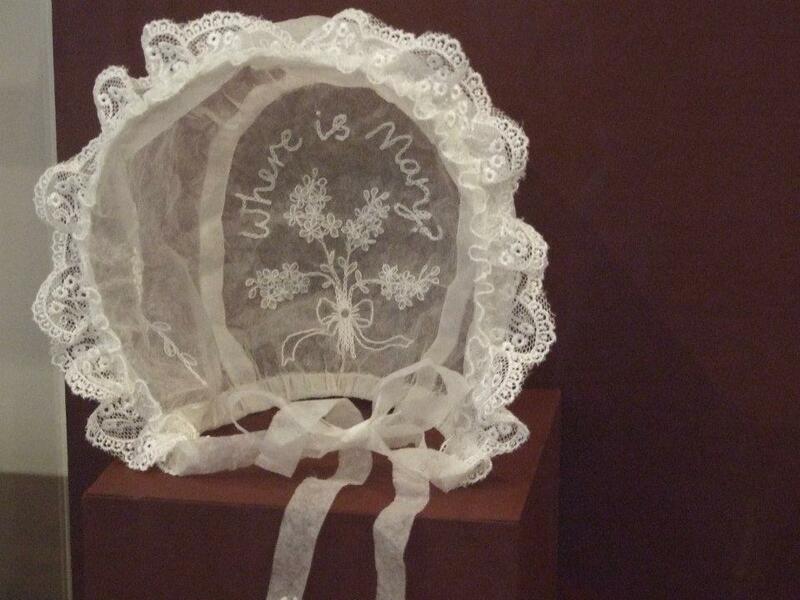 Bonnet which reads “Where is Mary” by Belinda Durrant, picture by Sudeley Castle. This entry was posted in The Dowager Queen Katherine (1547-1548), The Family of Katherine Parr, The Queen's Households and tagged Belinda Durrant, catherine parr, katherine parr, lady mary seymour, lord seymour, mary seymour, sudeley castle, sudeley castle exhibit by tudorqueen6. Bookmark the permalink.